If you are creating your color coded file labels with File Label Express, all you have to do is contact us and we’ll work with you to create an automated tracking solution that meets your needs and your budget. RFID is not for everyone, but for those that need it or could benefit from this remarkable technology. Are you already looking at File and Document Tracking with RFID? Then you should consider File Label Express. File Label Express wasnt’ retro fitted to enable this technology, it was DESIGNED to use this technology just as it was designed to run on your existing mobile infrastructure. 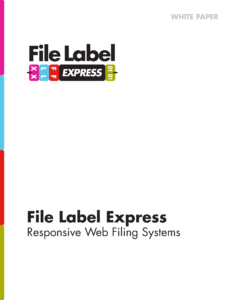 File Label Express is cutting edge technology, not technology struggling to keep up with advancing methods. File Label Express allows you to start large or small and for Enterprise systems, no one can beat the features and ease of use that File Label Express offers. If RFID tracking, scan on demand, end to end, life cycle tracking and enabling every available method to manage your records is what you need, then you need File Label Express! Our attractive pricing models for the latest technology to manage records can compete with anyone.